Preheat oven to 350 F. Lightly grease and flour 2 9″ cake pans. Set aside. Combine the flour, salt, baking soda, and cinnamon in a medium bowl. Set aside. In a large bowl, beat the eggs, sugar, oil, buttermilk, and vanilla on high speed until smooth. Add the dry ingredients and beat on low speed until combined. Fold in the carrots. Fold in the pineapple, coconut, and pecans (if using). Divide the batter evenly among the pans and bake for 25-30 minutes or until a pick inserted into the center of the cakes comes out clean. While the cakes are baking, prepare the buttermilk glaze. Drizzle the glaze over the warm cakes and then cool the cakes completely on a wire rack. When the cakes are cool, tear four thin strips of parchment or wax paper or aluminum foil and make a square on the serving plate. Place one layer on top of the square. Prepare the cream cheese frosting and spread some frosting on the bottom layer of the cake. Place another layer on top of the frosted layer. 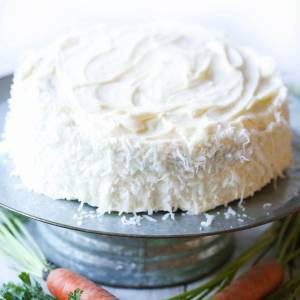 Frost the entire cake with cream cheese frosting and decorate with coconut and chopped pecans if desired. For best presentation, refrigerate overnight before serving. This cake has many steps and can be overwhelming to make all at once. The cake layers can be made in advance and refrigerated or frozen (in the pan, with the buttermilk glaze) before icing the cake.